Pop up displays from MSP-Signs.co.uk are the best solution for trade show, exhibition and for any another show. Our pop-up stands are very easy to assemble, great value for money and absolutely amazing opportunity to stand your company out from the crowd. We offer many different options from frame only to complete pop-up display including the graphics designing. Excellent service, Great price & Super Fast Delivery are our motto. Please note! 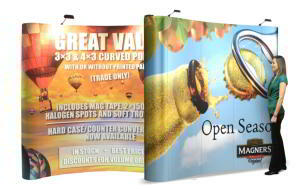 If you would like to order more Pop up Displays then three, please contact us on sales@msp-signs.co.uk or call us on 0845 116 2548 to get a better deal.